You are currently browsing the Bringing Jerry Zimmer Home blog archives for November, 2010. 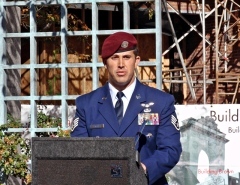 This annual Veterans Day ceremony, organized by the Student Veterans Society and sponsored by the Offices of Campus Life and the Dean of the College, featured speeches and appearances by students, administrators and guests, including U.S. Sens. Jack Reed, D-R.I. and Sheldon Whitehouse, D-R.I. The ceremony began at 12:30 p.m., with the Providence College Patriot Battalion Honor Guard leading participants from the flagpole on the Main Green down to Lincoln Field, near Soldier’s Arch.